I CANT BELIEVE IT, I HAVE TRIED EVERYTHING! FIBROMYALGEN BY PROGENA IS AMAZING! SO FAR I AM NOT TAKING PAIN MEDS EVERYDAY. HOPEFULLY IT WILL CONTIUNE! I have only taken Fibromyalgen by Progena a few days and I'm already sleeping better. I guess I didn't know how much pain I was in, because I was used to it. Since I started taking and using Progena by Fimbromyalgen (formerly Fibromyalgia) 3 times a day I am not having as much pain. I don't ache and hurt as much. I sleep better at night. Don't have the insomnia as much. 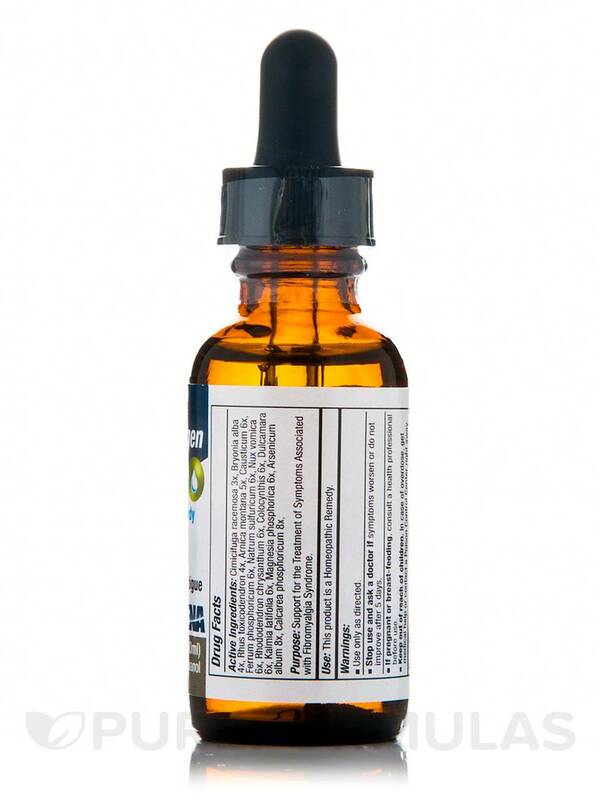 If you’re looking for a liquid homeopathic supplement that might work to relieve certain symptoms associated with mild pain or stiffness‚ Progena’s Fibromyalgen may be right for you. According to proponents of homeopathy‚ highly diluted amounts of natural substances may work to stimulate your body’s ability to heal itself. For this reason‚ every serving of Fibromyalgen contains a wide array of herbs that could potentially act to maintain optimal joint and muscle function‚ including rhus toxicodendron. Moreover‚ cimicifuga racemosa (black cohosh) may help address minor discomfort in the head‚ neck‚ and back. In addition‚ Fibromyalgen provides kalmia latifolia‚ which may work to alleviate mild shooting pain in your muscles. Furthermore‚ rhododendron chrysanthum might play a role in relieving mild headaches or joint pain‚ while causticum could potentially act to alleviate overall soreness. Last‚ this Progena supplement may help address some signs of mild fatigue because it contains an herb called bryonia alba. 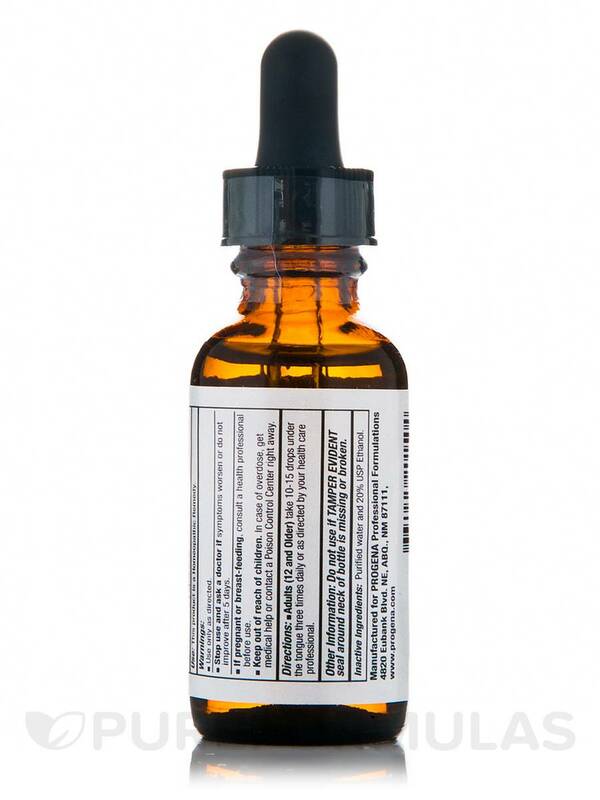 Every bottle of Fibromyalgen by Progena contains one fluid ounce of solution. Cimicifuga racemosa 3x‚ Bryonia alba 4x‚ Rhus toxicodendron 4x‚ Arnica montana 5x‚ Causticum 6x‚ Ferrum phosphoricum 6x‚ Natrum sulfuricum 6x‚ Nux vomica 6x‚ Rhododendron chrysanthum 6x‚ Colocynthis 6x‚ Dulcamara 6x‚ Kalmia latifolia 6x‚ Magnesia phosphorica 6x‚ Arsenicum album 8x‚ Calcarea phosphoricum 8x. Adults (12 and Older) take 10-15 drops under the tongue three times daily or as directed by your health care professional. My 22 year old daughter has had pain in her legs and arms all her life. Doctors would say it was restless legs or growing pangs and I knew it was more. We have tried many things in the past to no avail. 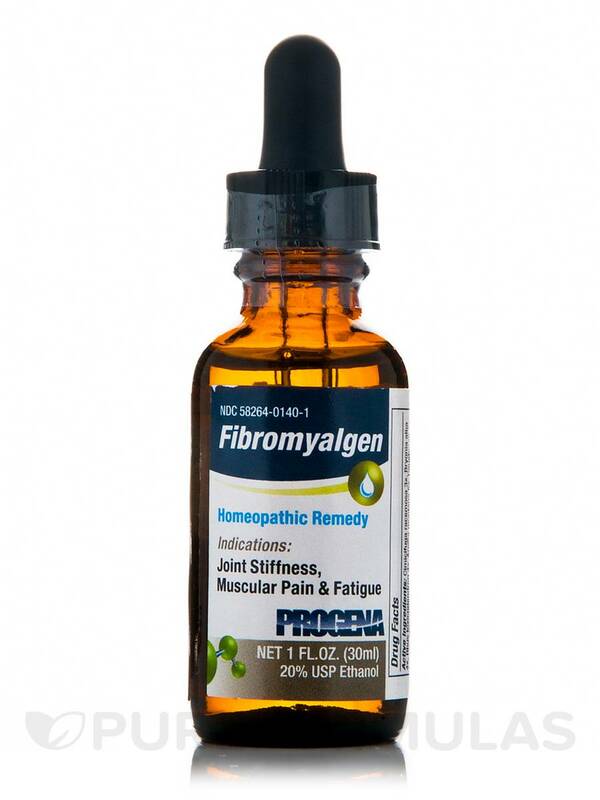 My daughter just got a job standing on her feet all day and lifting....I bought this Fibromyalgen (formerly Fibromyalgia) by Progena and the first time she took it...she was amazed. She now takes it every day that she works and if she plans to be walking for a while. We are so glad to have finally found this formula that we have told our family members of it and some plan on purchasing the product. I would recommend to anyone who is suffering with fibromyalgia just to give it a try...I hope it works for you as well. We will be purchasing more. The item has worked very well for me. It is easy to use. The drops start to work quickly. The bottle is too small. Fibromyalgen by Progena has helped tremendously. The very first week I used this my joints felt better and my muscle recovery after my workouts improved DRAMATICALLY! I thought maybe I was experiencing the "new hopeful" placebo affect but after week two of feeling better than I have felt (muscle & joint wise) than I have felt in a VERY long time, I decided it was real. Placebo or not- I feel better and that is the result I needed! It has little taste, easy to use and it is affordable. I just wish it came in a giant bottle! Small bottle, but it's also wonderful because you can carry in your purse- which I do! I was using the pellets of everything that is in this bottle. Then I found Fibromyalgen by Progena, I could not believe it, all 5 different pellets that I was using for pain is in this one bottle! Soo much more convenient, and it really helps my fibromyalgia. Works well after 3 days of use! I have tried many homeopathic remedies for pain associated with fybromyalgia including the pharmaceutical - gabapentin. I did notice an improvement in pain alleviation with Fibromyalgen by Progena. I would equate it to about 50% of the relief experienced with gabapentin which I can't take due to side effects except in extremely bad days. I will post new information as I use them for a longer period of time. I will reorder and give this product a chance as it did make a noticeable difference. Fibromyalgia is complicated so many small improvements are all adding up to an overall alleviation of the symptoms. All good - no cons. What I like about this item is that it helps me sleep and my pain is not noticeable like it was. The taste I don't particularly care for. I've had fibromyalgia and some other medical issues for going on 10 years now. Most of those years I was on prescriptions to help control my pain, but I would have to deal with the nasty side effects. Recently I switched over to all natural supplements and Fibromyalgen (formerly Fibromyalgia) by Progena is one of them and has been a life saver. I take it once-twice a day and it works better than any prescription medication ever has for me and without the side effects!